Interesting that "The Briefing" follows the same title style as "Afternoon Live"
Not sure if I asked this before but if I did I’m pretty sure I didn’t get an answer but do two of the Furios (presenter left viewer right) closest to the rostrum share the same track? I know the system can handle two dollies on the same track segment. Also it appears the BBC San Francisco bureaux moved into the CBS bureau. The Cronkite map is the giveaway. I think there are actually 3 tracks for the 5 cameras. The outer ring that goes behind the screen has 1, there's a little track with 1 at the front of the desk, next to the catwalk and the ramp to get to the desk, and 1 which goes around the desk platform which has 3 cameras. You just got to admire the studio design it looks so versatile and futuristic it could easily last a few more years. Personally, an update to the skyline backdrop used on BBC WN wouldn't go a miss. Maybe something a little different or an alternative shot of London? Well BBC Sport has had an update. 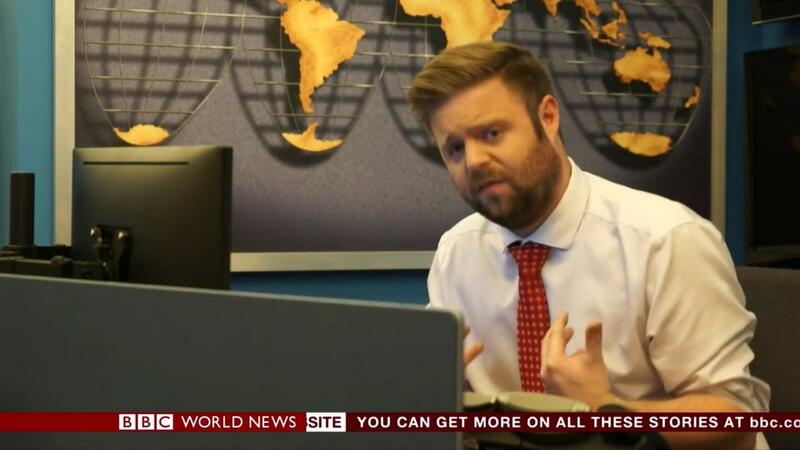 Is it time for BBC News? In my opinion its time. From strictly a presentation look, (not budget or content viewpoint) its served the BBC well. But maybe its time. It was innovative for its time. But its been copied and imitated by so many broadcasters around the world. It would be interesting to see what fresh new ideas they can come up to innovate the presentation, than just massaging the swirling red/white globe. Of course the red is the signature, so what can they do to move the presentation forward? Would be interesting to see the next trend setting look. Im sure many will disagree. But each to their own. BBC News is a much larger organisation to bring into line. And BBC News has to manage their own budgets. It will happen, but in terms of time scale, its easier to handle the other channels and even BBC Weather as it moves to a new provider and new software. That's just a lazy excuse IMO. Other media organisations (smaller than the BBC, but bigger than BBC News) have managed company wide rebrands on a single day and the BBC should have the confidence to do it too. The BBC did manage an organisation-wide rebrand in 1997 to such an effect that Look North went to the trouble of re-editing it's short bulletin titles to use the new logo for that weekend before a full relaunch on the Monday. In many respects that was the pinnacle of corporate identity, a simple branding that every outlet could adopt easily so everything looked like it was coming from the same place but with some flexibility to establish brand personalities. Unfortunately we are living in times where the BBC is seemingly on life support, and can not afford (in terms of money and press coverage) to be seen as "wasting money" on rebrands. BBC News will no doubt see a re-brand in time, and it will have to work with at least the news bulletins, Regional, National, World and News channels. Global News may come at a later time or be included in the re-brand proper. I could easily see the VizRT stations rebranding at once - wouldn’t that be BBC News, World News, The Nations (I’d assume), it appeared some of Global News runs Viz Opus (which can do graphics) so they could be included, and what London and Salford regionally? The problem would be those extremely outdated regions that are running systems that are what 10-15 or more years old and the one or two bureaus running CasperCG. They would all have to be recoded to match.